POP email accounts are email addresses that will store email in an email box on the server. Email can be retrieved from a POP email account with standard email software. In addition to receiving email, each POP email account user is given access to send outbound email through our service. Email Address - Enter the email you want on your domain. For example, it might be "sales" or "support" to create an email address such as sales@YourDomain or support@YourDomain. Password - This is the password your email software will need to download your emails. It will also be the password you need to send outbound email if you select the Enable SMTP Authentication option. POP Login - This is the login id your email software will need for downloading your emails. If you leave it blank, a login ID will be assigned for you. User's Name - This is optional and is just used in the control panel to help you remember who you want to assign this POP login to. 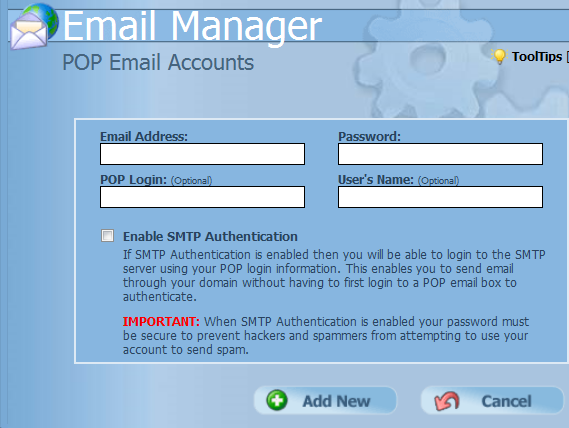 Enable SMTP Authentication - If SMTP Authentication is enabled then you will be able to login to the SMTP server using your POP login information. This enables you to send email through your domain without having to first login to a POP email box to authenticate. NOTE: If you are transfering your domain from another host, note that the next step is not done until after your domain is active on our service. Now that you've set up your email account through the control panel, you now need to set up your email software to pick up and send email through the account. Refer to your email software help instructions for creating a new account. Most email software will have a wizard of some sort to help you through the process of setting up your email software and you will just need to fill in the blanks. POP Server (Incoming Mail): Enter your domain name. Return/Reply-To/From Address: Enter the email address of this POP account.